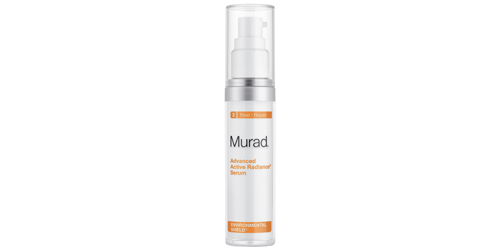 The Advanced Active Radiance Serum is a relatively new anti-aging serum by Murad. Murad claims that the Advanced Active Radiance Serum “rapidly boosts radiance and reverses visible signs of environmental damage”. It’s also claimed that this serum helps to improve brightness, clarity and radiance. A lot of claims if you ask me, lets see if the claims are true or false. The packaging of the Advanced Active Radiance Serum is not only pretty but also hygienic and made very easy to use. The ingredients of the Advanced Active Radiance Serum are not bad but certainly not super good either. We like the fact that it’s stuffed with Vitamin C, but a good serum needs more than Vitamin C. We love the fact that Murad also uses Camellia Oleifera Leaf Extract, a green tea, which can prevent collagen breakdown and reduce UV damage to skin. To bad Murad uses a fragrance in a serum, but we didn’t find harmful ingredients in the list. The serum is lightweight and not sticky. Applying goes easy and smooth. Hmmm we are not convinced. We don’t mind that it’s not cheap ($89,-), but no shocking results at all. The girls did noticed a brighter skin, but that’s it. If you are looking for a good serum, there are better (and cheaper) alternatives. Best Anti-Aging wouldn’t recommend this serum.